The barri of El Raval (Arabic for ‘an area outside the walls’) is the largest section of the old city, closed in by the Ramblas, Avinguda del Paral.lel and the Rondas of Sant Pau, Sant Antoni and Universitat. Originally a preserve of orchards and gardens, the Raval was embraced into the city by the 14th-century walls. Convents and monasteries moved in to fill up the gaps between the gardens, while other corners became havens for the city’s rejects – its unpleasant trades (tanning and butchering), its criminals, its poor and diseased. Things got worse in the 19th century. 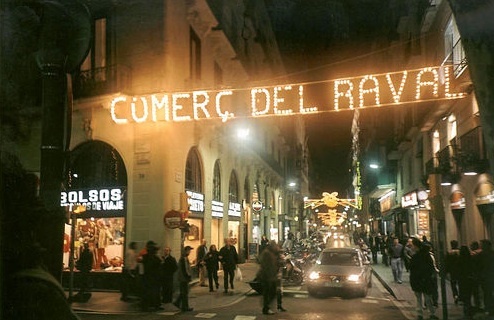 The Raval boomed along with Barcelona’s industrial revolution. Cheap land attracted the first factories; workers were cramming into new tenement districts near them, and by the 1850s the Raval (then known as El Quinto, the Fifth District) was one of the unhealthiest and most wretched neighbourhoods in Europe. The average life expectancy was 40 years; criminally low pay, coal smoke, epidemics and illiteracy were the order of the day. The lower part of the district became a crowded den of misery, prostitution and crime known as the Barri Xinès—'Chinatown', where the Anarchist Rose of Fire bloomed the hottest before turning to ashes. Always Barcelona's centre of organized crime, in the 1970s it became awash in drugs and street crime, one of Europe's biggest heroin ghettos. The city cracked down hard. The big clean-up, the esponjament, involved lots of cops, and perhaps more effectively, lots of builders, with massive demolitions of the worst tenements. El Raval is still poor and full of immigrants. Sixty years ago they came from southern Spain; now it's Pakistan, Morocco, the Philippines and a hundred other nations. No part of Barcelona has received as much attention from the urban surgeons of the Ajuntament in recent years. The northern half of the Raval, always more genteel, is becoming yet more so thanks to the new, dazzling white Museu d'Art Contemporani, seemingly dropped from the sky like a giant respectability generator. Even Barri Xinès is only a shadow of its former self. Located just off the Ramblas, with two big markets close by, along with plenty of interesting small shops and old-fashioned neighbourhood bars full of character, El Raval has a lot going for it. But just the nature of the place—the housing stock of tenements and converted factories, on extremely narrow streets that get little sun—has kept gentrification at bay. There's a good mix of people here now, and a gritty ambience that many Barcelonans appreciate in their polished and pampered city. Today, El Raval's statistics in health, education and income have improved considerably, less a reflection of gentrification than Barcelona's success in taking care of its people. The crime rate has declined too, to somewhere just a little higher than the city average—still, watch your bag or wallet when wandering, and don't go poking around dark corners at night. The Contemporary Art museum was only part of a city plan to make the northern Raval into a cultural centre. Nearby you'll find the Centre de Cultura Contemporanìa, the original building of Barcelona's University, and the former Hospital de Santa Creu, now the Library of Catalonia. There are some pleasant streets to explore around the Plaça del Pedró, and another landmark essential to Barcelona's soul (and stomach), the recently restored Sant Antoni market. Down in the louche Barri Xinès, the first stop is something entirely unexpected: a tycoon's palace, specifically the mansion that Gaudí built for his famous patron, the Palau Güell. Two weary survivors of the pre-industrial Raval are worth a look, the churches of Sant Agustí and Sant Pau del Camp. The Rambla de Raval, a new park made from three blocks of demolished slums, shows off the neighbourhood's revival, and on the edge of the district is Barcelona's funky Broadway, the Avinguda del Paral.lel.